Electrical systems are the lifeblood of most plants, and keeping these systems in working order is essential not only for maintaining uptime and meeting production goals but also preventing electrical accidents and improving worker safety. Staying abreast of evolving standards can be costly and time-consuming, but the repercussions of an arc flash incident or other electrical hazard can be far-reaching. Here are three key pieces of advice that will help improve the reliability of your electrical systems in 2018. Every three years, the National Fire Protection Association (NFPA) updates NFPA 70E: Standard for Electrical Safety in the Workplace®, and the 2018 release is putting a greater emphasis on eliminating hazards rather than just protecting against them. According to Steve Park, author of Your deep dive into NFPA 70E 2018: "A notable change in NFPA 70E 2018 is its focus on hazard elimination. In fact, the hierarchy of risk control methods has now moved from an informational note to part of the standard’s mandatory language. When it comes to implementing safety-related work practices, the standard clearly states that hazard elimination shall be the first priority. This means that taking steps just to mitigate a hazard may not be enough to protect your employees and plant and reduce your liability. "If elimination isn’t an option, then substitution is the next best thing. This could mean opting to use less-dangerous equipment, such as nonelectrical or battery-operated tools. Engineering controls are next in the hierarchy and can be as simple as ensuring ground fault circuit interrupter (GFCI) protection or as advanced as changing the relay logic in your power distribution system." This year, Plant Services conducted its first State of the Industry Research report focusing on electrical safety. Many of the responses were surprising, especially concerning plant compliance. Accord to Thomas Wilk, author of Is your plant a safe plant? 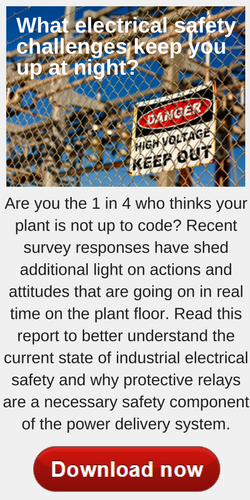 Results of the 2018 Plant Services electrical safety survey: "There also was one question on the survey designed to uncover your overall perception of electrical safety at your facility: Do you consider your plant electrically up to code? "25% of respondents replied 'no'; that share that did not vary significantly across any of the demographic groups – job title, vertical, generational, plant / team size, experience or certification level – identified in the initial survey questions. "This number maps interestingly onto two other survey questions. The first of these asked about your facility’s average time between electrical incidents, to which 25% of respondents said the average time between incidents at their plant was six months or less, and again the data did not vary significantly across demographic categories. "The second question asked about whether your facility engages in near-miss reporting, and 72% reported having a formal near-miss reporting program in place. The other 28% indicated that either an informal program exists (18%) or no program is currently in place (10%)." Selecting the right maintenance strategy for your electrical infrastructure can mean the difference between proactive optimization and electrical accident. According to Jeramy Freeman, author of Electrical maintenance for the win: "A properly planned and executed electrical maintenance strategy is a vital component in supporting electrical workplace safety, business continuity, and optimized total cost of ownership. Plant managers should schedule proactively and employ a variety of approaches to maintain electrical distribution equipment. An industrial plant experienced damage totaling $100,000 (USD), not counting the cost of downtime. It was discovered that dirt, gummy deposits and iron filings in the main switchgear caused the failure. The cost of this event would have supported a comprehensive electrical preventive maintenance program covering all of the plant's electrical distribution system for several years." Learn what freight trains and electrical systems have in common.